 Log In needed $10 · RARE! 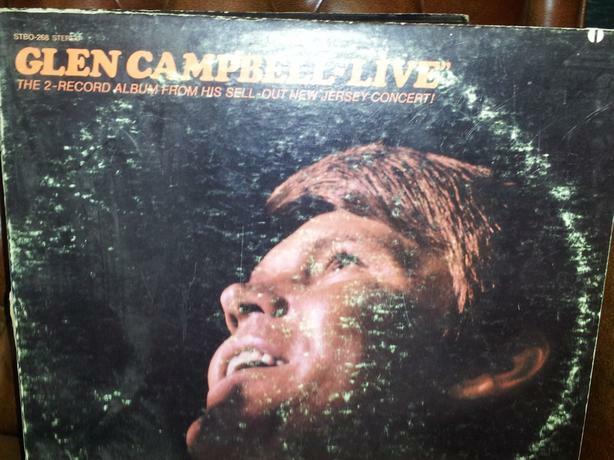 VINTAGE "2-LP" RECORD SET GLEN CAMPBELL "LIVE IN NEW JERSEY"
GLEN CAMPBELL AT HIS BEST! Live Album from 1969. EXCELLENT sound production. READ about this Album! so it's a Collector's Treasure to be sure. COVER= GOOD. RECORDS=VG W/ barely LIGHT scratches. This Album represents "The Rhinestone Cowboy" at his Zenith! in an Alzheimers' Care Home in Nashville. Catch the Best of this Incredibly Talented Guitar Player. Famous Singers, and Bands., and had a highly Successful TV Show. This Album showcases his many Talents. Although Gatefold cover is obviously worn, it IS intact. 60's Lounge Music set to strings. Rockland Area of Fort St. near St. Charles St./Stadacona Ave.